We've Got Fraser Island Covered! Let us manage the tides, traffic and terrain, whilst you just sit back and enjoy the ride - there are a number of great tour options that leave the resort daily. Kingfisher Bay’s Ranger Guides are passionate about Fraser Island and their local knowledge will make your day’s touring an absolute breeze. We’ll provide entertaining and informative commentary about the island's rich cultural and environmental history - and make sure you see the beauty spots the island is famous for! This tour is for up to six people in a 4WD and allows you to explore the island at your own pace. You can pre-plan your Fraser Island experience, with input from your guide, or make spur of the moment choices as you go. If you like bush walking - we can tailor a trip made for you; fishing - no problems; or if you just want to avoid other holiday-makers and find a perfect pocket of Fraser to have to yourselves - we can accommodate. 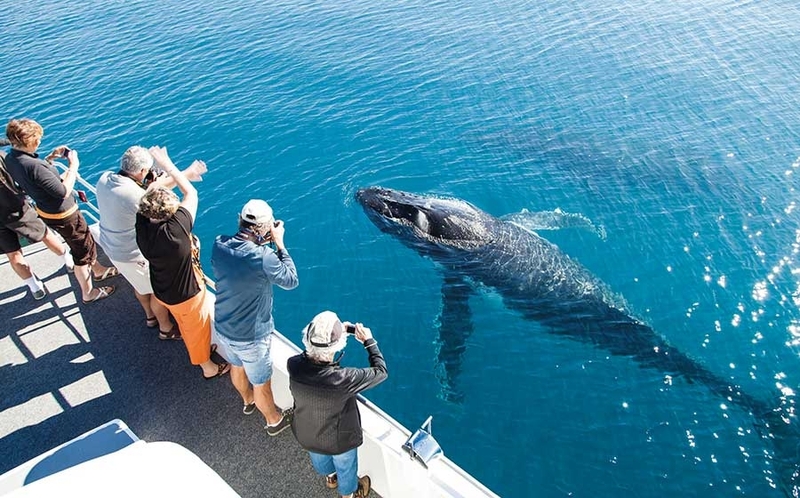 From August to October the sheltered waters around Fraser Island come alive in a very big way - as thousands of Humpback whales stop off for a bit of socialising with their young in our neck of the woods. This natural phenomenon offers some of the best whale watching in the world - and the action takes place just a short cruise from the resort. Half-day whale watching cruises leave daily during the season.